Smoke at 229 Loop 116 was so heavy that the burning home was hardly visible. Home Possibly Totaled by Fire, NEW WILLARD, February 19, 2013 - At around 12:20 pm February 19, 2013, a house fire was reported off Loop 116 (about 5 miles north of Livingston). Firemen from Livingston arrived to find a burning home located at 229 Loop 116. Heavy smoke was billowing from all areas of the roof of the house. Evidence suggests that the fire started in the back of the house in the area of the home's water heater. Scenic Loop and Onalaska VFD's arrived to assist in dousing a stubborn fire that was difficult to get to. The fire managed to spread to between the roof and the ceiling framing. A preliminary investigation was launched by Seargent Rob Thomas with the Polk County Sheriff's Office. The owner of the home, Joann Ramirez and her husband and their daughter reside in the home. Nobody was injured in the incident. Firemen managed to get the fire under control in about an hour. The case will be turned over to Polk County Fire Marshall, Jay Barbee. 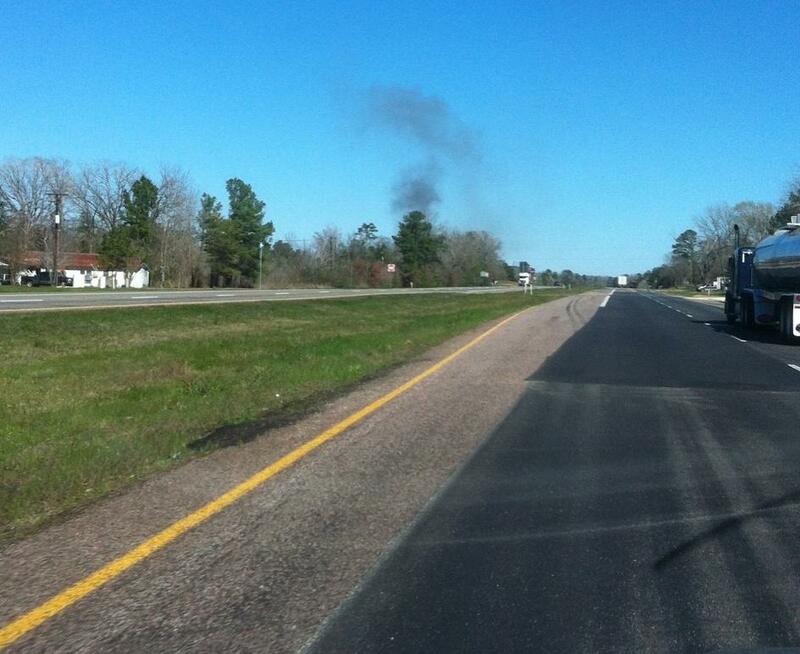 Smoke was visible from Highway 59. Smoke was billowing from every opening on the roof. Tankers from Livingston VFD parked in the driveway. Seargent Rob Thomas with the Polk County Sheriff's Office began a preliminary investigation. Firemen had to peel back the metal roof in order to completely extinguish the fire. Flamed retardent foam shoots through the roof from a fireman spraying the interior ceiling of the home. This dog was at the neighbor's house and was clearly frightened from all the excitement. The fire is believed to have originated on the backside of the house. A lineman from SHECO disconnects power from the burning home. Firemen do their best to save belongings for the homeowners. The water heater in the back of the home is a prime suspect.